Gardeners are probably the easiest people to buy gifts for. Because they are very nice people, they also appreciate and value a gift that’s associated with their favourite past time. 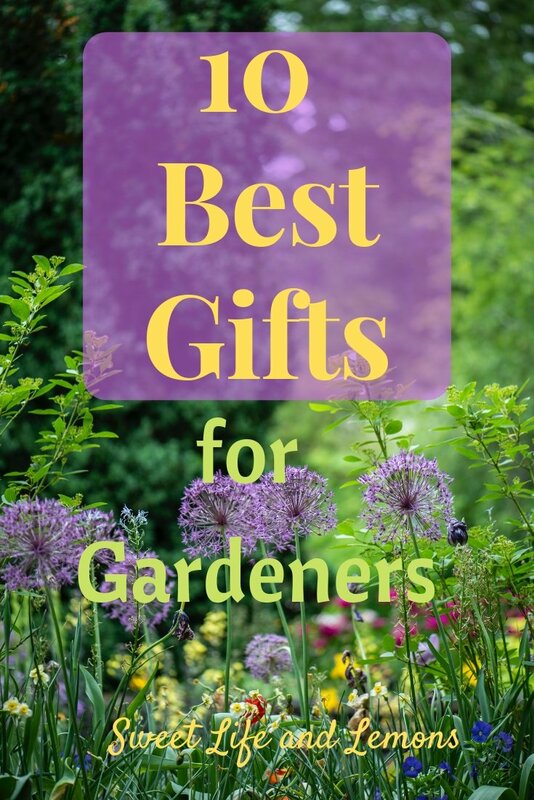 There are many occasions throughout the year that you may need to find perfect gifts for gardeners. Christmas, birthdays, anniversaries, mothers day, fathers day… no problem. If they love to garden, you will find the perfect present. Perfect gifts for gardeners are easy to find, but it’s a good idea to think about the type of gardener this person is. Do they spend a lot of time outside or in a greenhouse? Are they energetic and strong or do they have difficulties kneeling or doing heavy work? Are they all about their plants and flowers or a vegetable grower? If they have difficulty kneeling or reaching certain areas of the garden, there are many tools that help. When buying tools, consider also if this person is left or right handed. I have selected some gifts that I feel are perfect for that gardener in your life and they will just love unwrapping them! Click on the pictures or product name and you can check out all the details. I have included a variety of price ranges, so there is something for every budget! Excellent gift for planting herbs, plants or vegetables, easy to reach and no more bending down! Keeps slugs and snails away too. The gardener in your life will love this sturdy little potting bench. There are more fancy models available but for the price I think this does the job perfectly. I use this one myself and I am very happy with it. It really makes potting up plants so much easier and it has handy hooks at the side to store your hand tools. I love this! There is always so much I am carrying from one end to the garden to the other. Pots, tools, plants, bird baths… you name it, I haul it around the garden. This foldable cart is so useful and will save you lots of trips up and down the garden. This is so useful if you want to garden but your knees say ‘no’. With this practical folding seat you can have a sit down while pruning the roses, or turn the seat around and use it as a kneeler with the added bonus of having grip bars for support. Ideal! Whenever I prune my roses or cut down my brambles, I always look like I’ve had a fight with my cat. These gloves provide you with good protection when fighting those pesky thorns! I bought this little moisture tester last year because I was always unsure when to water my houseplants. This little tester is amazing, no more thirsty plants and I use it in the greenhouse and indoors. It’s very reliable and hasn’t let me down. I’d have been really pleased if I got this as a gift! I bought this last summer and it has been very helpful for carrying my gardening gloves and tools. It’s quite a sturdy canvas bag with adjustable straps and is machine washable. Now I can keep my most used tools and gloves in one place. I really like this gift idea! These are specially made clay balls filled with seeds that you scatter wherever you want the plants to grow. This particular mix is a special wildflower seed mix to attract bees and this is an ideal gift for a wildlife loving gardener. There are other mixes available, like a herb mix, salad mix, poppy mix, wildflower mix and others. Winner of *GIFT OF THE YEAR 2017* & *BEST NEW GARDENING PRODUCT 2017*. As seen on BBC, The Guardian and sold at Kew Gardens! Can’t go wrong with this and so affordable! This is a really attractive solid wood bird feeding table that can be hung up. So pretty, this would appeal to anybody with a garden just for its decorative value. I like that this one is quite small and only the smaller birds can feed on this. In our garden, I find that some of the bigger birds bully the smaller ones on our feeding station and this would avoid that problem. This is available in other sizes too. No gift list would be complete without mentioning books. Personally I can recommend anything by James Wong, especially if you’re a beginner. I love how he makes it all sound so easy and I have followed a lot of his advice in the garden, which has helped me feel far more confident in what I do. But books can be a personal choice, so I leave it up to you to decide. I hope this list of ideas has helped, let me know if there is anything else I should add for a future follow-up list or if there are any gifts you have received that you love. As I am browsing through your website can I say I absolutely love it and all the colours in it. This blog post you have done has given me some great ideas for my friends who love gardening. I love the bee mix Seed balls. I can almost imagine the flowers blooming just from that jar. What an awesome little gift or even a little thank you present. I just love this whole website I shall be sharing it on my social media and with my friends too. Thank you so much. Looking forward to reading more. I think I may buy a few products here. Thank you so much Deborah for your lovely comments. I’m really glad this post has given you some ideas for gifts, it can be a bit of a nightmare to find the right things! If ever you need any help with gardening questions, you’re very welcome to pop in and ask away!